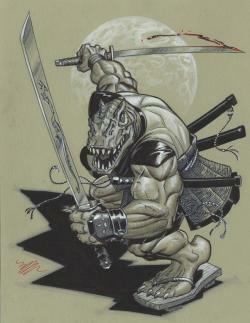 Chote is a dinosaur-like samurai that appears in Eastman and Laird’s Teenage Mutant Ninja Turtles. He serves an “evil wizard with no name” (later on revealed to be Savanti Romero). His action figure names him Shoate. Chote is first shown reporting to his master after having a battle with the Gosei samurai. He tells him that Oraga’s forces are stronger than ever, and that all the warring noble houses have pledged fealty to him. Afterwards, he is shown battling the Gosei samurai, and the turtlesappear with Renet. He fights the turtles and samurai, and is forced to retreat. After he informs his master about his encounter with the turtles and Renet, he is ordered to bring her back alive. After he captures Renet, his master asks about the scepter (Sacred Sands of Time) she had. He tells him that it vanished and that it will return. During the wait, Chote and his master take Renet into a cave to evade Oraga’s samurai. The turtles show up, and Chote is defeated. After Chote’s master is defeated, he becomes a ronin. Since he has no obligation to serve anyone, Renet decides to send him to a world better for him. He is sent to The Omnicron Seti star cluster of the galactic year 1070. He has not made any appearances since then. An action figure of Chote was released in 1994. He was renamed Shogun Shoate.